I *only* send an e-mail when a truly great deal comes out from Winnipeg. 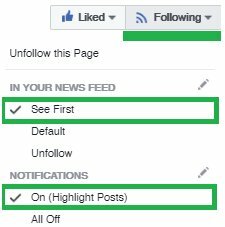 TIP: Immediately after you have Liked the page, click on 'Following' and set the option to 'See First' as shown in the image. Follow @YWGdeals on Twitter for new deals, and for deal updates. Join thousands of other people from Winnipeg in the Facebook Group to discuss the latest deals, and get amazing travel advice.